The cadets pictured after arriving in Belfast on the navigation. Two Army cadets from Orkney have sailed almost 600 nautical miles around the coast of Britain, honouring the fallen heroes of the First World War in the process. 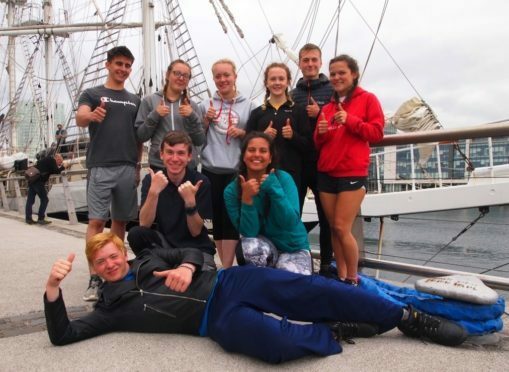 Caitlin Bruce, from Orkney’s St Ola Detachment, and Kieran Thomson, of the Kirkwall Detachment, joined 96 cadets and 48 veterans in embarking on a sailing adventure lasting 40 days, stopping off at each of the UK’s four capital cities. The cadets joined their counterparts in London on July 26, setting sail on a specially adapted ship named the Lord Nelson. During the tour the cadets and veterans stopped off at each capital city, hosting a special service and parade to remember those who perished in the Great War. During the navigation Lance Bombardier Bruce and Battery Sergeant Major Thomson took on various roles on the ship, including climbing the mast, setting the sails and manning the helm. Stops at Tobermory on Mull and at Scapa Flow on Orkney also took place, with a remembrance act taking place at Scapa Flow, where the HMS Royal Oak and HMS Vanguard were both sunk. Over £11,000 has been raised for the Jubilee Sailing Trust which helps fund adventures for Army cadets. Both cadets belong to the 1st Battalion the Highlanders which is a youth organisation that provides challenging adventure, sporting and community activities to aid in the development of young people in a fun and enjoyable manner.